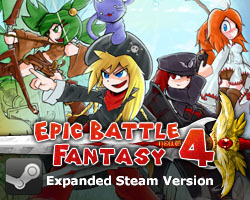 I just wanted to ask… when will EBF 5 be released on Kongregate? Because I can’t wait!!! SO WHAT?! I can wait! Gimme my coffee and Imma ready! So yeah… thanks for attention (I HOPE SO) and like I said… IMMA WAIT! Hey Matt, we’re working wrapping up a guide on our site and could use the source code for some datamining just to check it out. How should we go about doing it and then letting you know it’s us? Redemption, how do you use a profile picture? Just look through my code and and use the data you find, but don’t share the original files. Sorry what I meant was how do we get the source code? I click on the link and it’s the patreon page, do we send a custom pledge of $1? Just pledge anything and you’ll have access to all the Patreon-only posts, which includes quite a lot of different stuff. Patreon charges you monthly, so you can cancel after you’ve downloaded what you want. Perfect, the source code helped us find some optional dungeons and skills we missed thanks!. You can check out our full guide here if you want, and we’d love to hear any feedback or corrections from anyone. Neat. Your walkthrough looks quite in-depth. Make sure you mention it on the Steam guides/walkthroughs section as well, so more people see it! Maybe I’ll make a post about it soon. Always been a huge fan of your games! 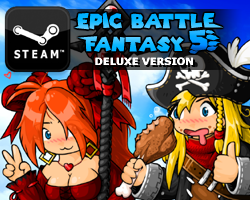 Quick question for you – For whatever reason I can’t save on the free version of EBF5 on your website. I’ll click the save button but then it just… doesn’t save (as soon as I exit out of the menu, it auto-deletes it). Is that an intentional feature? Hey Flamebirde, have you checked that your browser isn’t deleting flash cookies every time it is exited? The save files for these games are composed of flash cookies, so the browser could delete them. The default for deletions are every month if I’m not mistaken. If changing your cookie settings doesn’t work, you could save a backup before you quit the game, and then load the backup when you re-enter the website. But seriously, take a break, you deserve it!